Biodiversity, beautiful landscapes, and natural history collide in the Galapagos, making it one of the most magical places on earth. The islands are famous for inspiring Charles Darwin’s theory of natural selection. On a cruise or land & sea tour, embark on an adventure through the pristine national park and meet the unique animals living here. Browse our guide below for essential facts, travel tips, and top attractions on a tour to the Galapagos Islands. The Galapagos Islands captivate nature lovers and adventure seekers. With animal encounters and action-packed excursions galore, it’s a vacation you’ll be talking about long after you return home. A designated UNESCO World Heritage Site, the Galapagos is home to some of the world’s most amazing wildlife. Meet swimming iguanas, 500-pound tortoises, blue-footed boobies, and Galapagos Penguins (the only penguin to live in the tropics). Swim with friendly sea lions, colorful fish, sea turtles, and even the occasional pod of whales or dolphins. Explore the national park with a naturalist guide and uncover the ecological wonders of the archipelago. Then spend downtime relaxing at the beach. The oldest islands of the Galapagos are an estimated 5 million years old, while the youngest ones – Fernandina and Isabela – are still being formed by volcanic activity. For centuries the resident animals of the Galapagos Islands remained isolated from life on mainland. The first animals likely arrived on floating bundles of reeds or were carried by the ocean currents or strong winds. Reptiles and various types of birds began to flourish in the Galapagos, evolving over the generations. There are very few mammals in the islands. The human discovery of the Galapagos came in 1535 when Dominican Fray Tomás de Berlanga, the Bishop of Panama, was on his way to Peru to mediate an argument between a Spanish conquistador and his lieutenants after their conquest of the Incas. His ship drifted to the islands when the winds died. Since then, the Galapagos Islands have been a source of various social and economic interests. Pirates once used the islands as a hiding place for gold and silver treasures they pilfered from the Spanish. The location of the Galapagos also made it a convenient place to repair their ships and refuel food – principally tortoise meat – for future journeys. In the late 1700s, the islands became a hotspot for whalers. Unfortunately, the crews that worked on these missions significantly diminished tortoise life – even eliminating certain species – on some islands, taking tortoises in large numbersas they used the meat of these animals for sustenance during the months they were at sea. Fur hunters were also responsible for bringing the population of this Galapagos animal close to extinction during thisera. The Galapagos Islands became part of Ecuador in 1833. During the mid-1800s, Charles Darwin visited the Galapagos Islands during a scientific survey expedition aboard the HMS Beagle. He was amazed not only by how Galapagos creatures were so different from their mainland counterparts, but also by the fact that even between the islands, Galapagos species of similar characteristics still managed to adapt uniquely and perfectly to their own environment. The finch was one particular animal that caught Darwin’s eye, and it is now known commonly as the Darwin Finch. These finches were vital when writing his theory of evolution in The Origin of Species as he based some of his thought in assuming that the birds shared a common ancestry. The government of Ecuador declared the islands a national reserve in 1936 and later was declared a national park in 1959. In September of 1978, Galapagos was declared a Natural Heritage Site by UNESCO for its scientific prestige. The Galapagos Islands contain 13 primary islands and several smaller islets. The remote archipelago is located some 620 miles (1000 kilometers) off the coast of Ecuador in the middle of the Pacific Ocean. Differences in elevation and wind patterns create various ecosystems on each island. There are open forests of very large cacti, subtropical forests, humid dense forests;, and treeless areas covered by low grasses and ferns. Volcanic activity on the islands has left behind thousands of cones and calderas that take on a lunar-like appearance. San Cristobal Island is home to Puerto Baquerizo Moreno, the capital of the Galápagos Province, Ecuador. The town houses the island’s main tourist facilities. The entire island is being developed as a main tourist center, second to Santa Cruz. 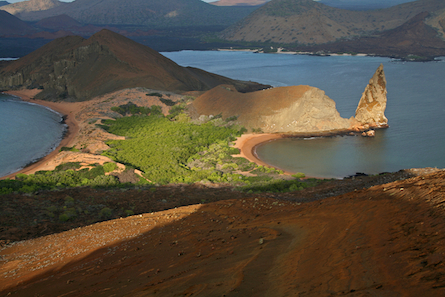 Santa Cruz Island is home to the archipelago’s largest human population. The town of Puerto Ayora on the island is the main hub for travelers – replete with hotels, shops, and restaurants. Baltra Airport connects Santa Cruz Island to mainland Ecuador. Baltra is the small island with Baltra Airport. Travelers who arrive at Baltra Airport take a bus to one of two docks where they will either board a cruise ship or a common ferry that will take them to the island of Santa Cruz. Seymour Island was formed as a result of the uplift of underwater lava formations. Situated north of Baltra, the entire island is covered with lush and low vegetation. Isabela Island is the largest island in the Galapagos, formed by the merging of six large volcanoes into a single landform. Puerto Villamil is the main town, albiet small and quiet, with a few restaurants, hotels, and tourism offices. Floreana Island is one of the oldest in the Galapagos. Its nutrient-rich soil is responsible for the beautiful, lush landscape in its highland region. 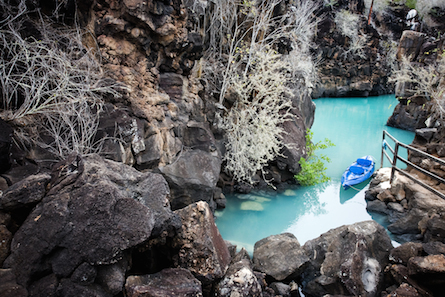 Only about 100 people live on the island, making it a less traveled destination in the Galapagos for land & sea tours. Devil’s Crown (a volcano that is almost completely submerged under the ocean) is one of the best places to snorkel in the Galapagos. Rabida Island has an area of almost 5 square miles and is recognized as the place to spot at least 9 species of Darwin finches. Genovesa is nicknamed the “bird island.” Its main attraction, Darwin Bay, is home to swallow-tailed gulls, frigate birds, red-footed boobies, lava gulls, doves, Darwin finches, and a variety of tropic birds. Pinta Island features active volcanoes on its northernmost point. 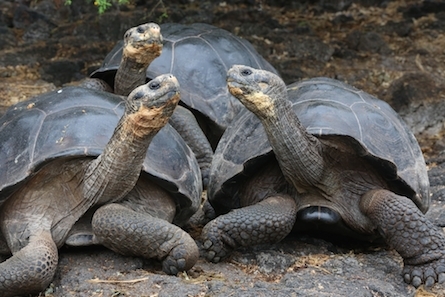 The island is home to a variety of animals, the most famous of which was Lonesome George, the Galapagos tortoise. 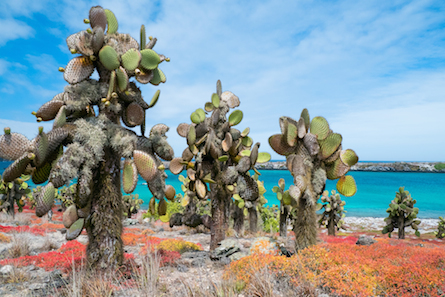 Española, at close to 3.5 million years old, is the oldest isle of the Galapagos. Sadly Española is dying, becoming a barren land with very little surviving vegetation. 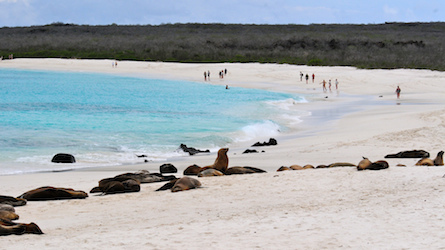 Still, the island manages to attract Galapagos sea lions since the decay process of the isle has given way to large bays. Fernandina is considered the youngest island. Fernandina is still being formed by an active shield volcano and vegetation is sparse. 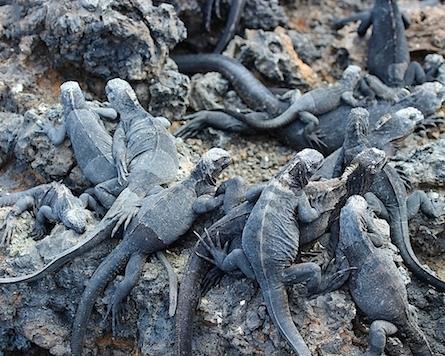 Punta Espinosa, a thin stretch of land where marine iguanas lounge on black lava rocks, is a main island attraction. Out of all the islands, Fernandina actually holds the largest colony of these interesting creatures. Santa Fe is located in the center of the Galapagos Islands. Vegetation forms a thick forest of the largest species of Opuntia cactus. Named after a Spanish city, the island is teeming with the Barrington Land Iguana. 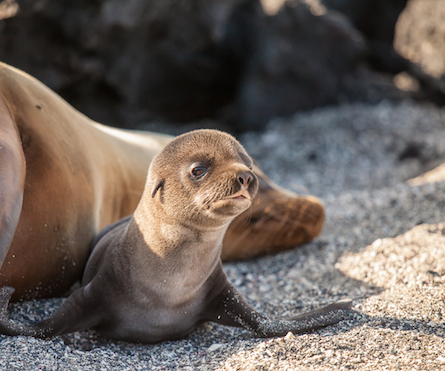 Visit Barrington Bay to spot a colony of sea lions or trek to the cliffs of Santa Fe which provide shelter for red-billed tropic birds, swallow-tailed gulls, land iguanas, and lava lizards. Santiago Island amasses to 360 sq. miles (585 sq km), including two overlapping volcanoes. The beautiful isle has many natural landmarks. At Puerto Egas, a lava shoreline with rock formations hosts a great assortment of wildlife such as marine iguanas and lightfoot crabs. Cousin’s Rock is a good dive site. The Galapagos National Park protects the delicate ecosystems of the archipelago and manages permanent conservation projects. About 97 percent of the entire area of the islands is protected and remain uninhabited. Explore the various terrestrial and marine sites with a certified naturist guide. Travel to the Galapagos would not be as unforgettable as it is without its amusing creatures. Many of the animals lack any concern over anyone approaching them. Endemic species living in the archipelago are completely different from their continental cousins. The finches that inspired the development of Darwin’s theory of natural selection and the giant tortoises are among the most iconic residents of the islands. Marine iguanas are the only sea-going lizard in the world. 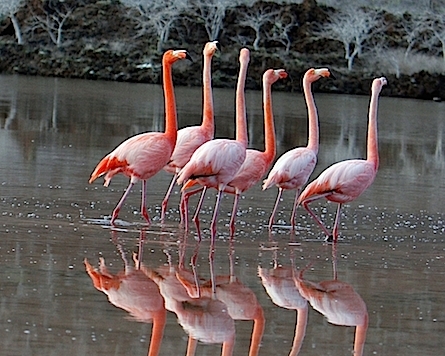 They can be spotted along the shores of many islands in the Galapagos. 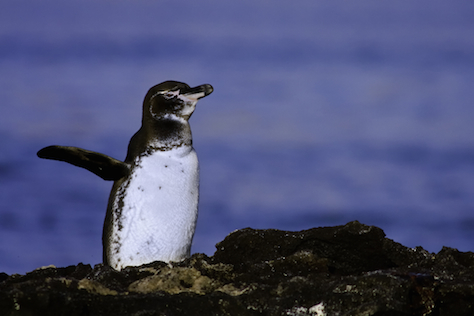 The Galapagos Penguin is the only penguin able to live on the tropical equator. These penguins can be spotted on the islands of Isabela and Fernandina. 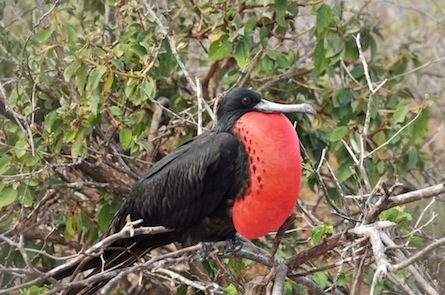 The Frigatebird is a large seabird. Males swell their bright red throat pouch, or gular, to attract a mate. The Galapagos Islands are located at the confluence of several ocean currents whose nutrient rich waters are home to magnificent marine life. While snorkeling, get up close to large schools of fish, penguins, sea turtles, and friendly sea lions. Each island has a variety of coral reefs, lagoons, and mangroves to explore. Snorkeling is a popular excursion part of a cruise package and land & sea tour. Eco-friendly practices are a cornerstone of tourism in the Galapagos. Stay on marked trails, leave shells and rocks in nature, and keep at least 6.5 ft (2 m) between you and birds or other wildlife. Enjoy the Galapagos at a slower pace. Relax on a white sand beach with turqoise waters crashing ashore. Marine iguanas may very well be there to bask in the sun alongside you! Trek to the top of Sierra Negra, the most impressive volcano in the Galapagos on Isabela Island, or go horseback riding in the tropical highlands of Santa Cruz Island. Exciting water-based activities include kayaking, standup paddleboarding, and surfing. If you’re in Puerto Ayora on Santa Cruz Island, definitely visit the Charles Darwin Research Station. Spend a few hours learning about the important conservation efforts currently underway in the Galapagos and visiting the animals there. This is where Lonesome George, the last remaining subspecies of giant tortoise on Pinta Island, spent his remaining days. The research station is operated by the Charles Darwin Foundation, an international nonprofit scientific organization. 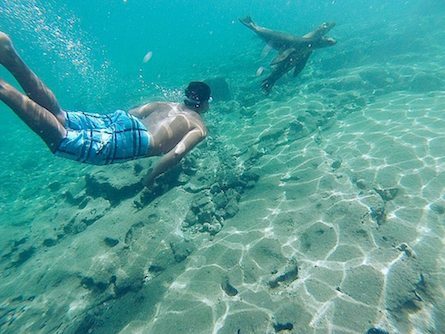 Plunge into the rich marine habitat of the Galapagos. In addition to sea turtles, brightly colored fish, rays, and various crustaceans, scuba divers have increased chances to see larger underwater residents such as reef sharks! Peak diving season is June, July, and August when the nutrient rich waters of the Humboldt current sweeps through the islands. Experienced divers should consider a cruise that’s designated for scuba diving excursions each day. Ask your travel advisor about a land & sea tour package with scuba diving! After experiencing the wonders of the Galapagos, you can extend you adventures to mainland Ecuador. 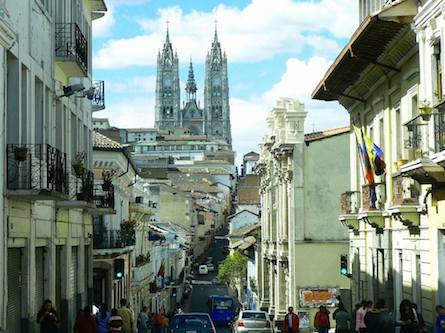 It is an incredible country abound with rainforest, Andean cultures, beautiful tropical beaches, and colonial history. Ask your travel advisor for more details. A cruise is a convenient and all-inclusive way to explore remote regions of the Galapagos Islands. Vessels range from mid-size ships and small yachts to sailboats. Breakfast, lunch, and dinner are included in a cruise vacation package. Snacks are generally served after excursions. Expect a variety of international and Ecuadorian dishes. Let your travel advisor know in advance if you prefer vegetarian meals. The widest variety of dining options are on Santa Cruz Island (in Puerto Ayora) and San Cristobal Island (in Puerto Baquerizo Moreno). Fresh seafood is the specialty of almost every restaurant menu. But if it’s the familiar you crave, pizza, pasta, and sandwiches are also available. The islands have a subtropical climate with pleasant temperatures throughout the year ranging from the mid-70s to mid-80s (22-28°C). The warm season is from December to June. During these months, there may be some scattered showers, but in general, sunny skies and warm temperatures are the norm. The cool season is from July to November. During these months, it’s typically cloudy and daily temperatures are slightly cooler. A misty-like drizzle, or Garúa, is brought from the cold Humboldt Current. Cruises are a convenient and all-inclusive way to explore the archipelago. Many of the national park site are very isolated – such as Darwin and Wolf Islands – and can only be accessed by boat. Cruises often travel between islands at night, so you wake up at a new destination to explore each day. All meals are served on the boat. Choose from mid-size cruise ships, motor yachts, catamarans and sailboats. Itineraries vary. Land & Sea Tours offer more trip flexibility. Enjoy guided excursions within the national park and then return to your hotel (in a port town) for a good night’s sleep. There are hotels, restaurants, souvenir shops, and even a few night clubs in the most developed towns of Puerto Ayora (Santa Cruz Islands) and Puerto Baquerizo Moreno (San Cristobal Island). Peak Season is December to January and June, July, and August. Wildlife activity varies from month-to-month and island-to-island. Ask your travel advisor what animals you’re likely to encounter during your specific travel dates. 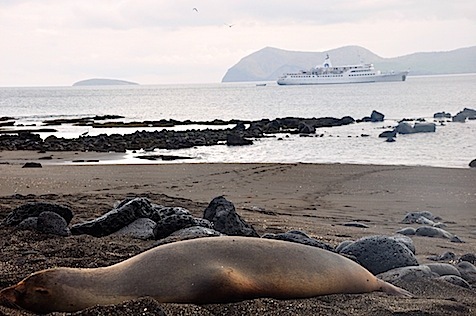 Sun seekers enjoy the Galapagos Islands during the warm season from December through June. There are occasional scattered showers druing these months, but in general travelers enjoy a sunny vacation. A good rule of thumb is to book early when planning a trip to the Galapagos. How early? Usually about 1 year in advance. This is particularly true if you want to visit during high season when some cruises book 12 to 18 months in advance. 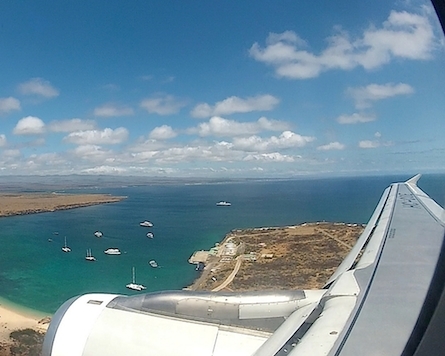 Nearly all travelers fly to the Galapagos Islands from mainland Ecuador. Even cruise passengers fly there and then board their boat in the archipelago. Two main airports in the Galapagos are on Balta (near Santa Cruz Island) and San Cristobal Island. There is another airport on Isabela Island for inter-island transportation. We recommend travelers arrive to the airport 3 hours before their flight departure. Airline weight restriction for checked luggage is 44 lbs (20 kgs). 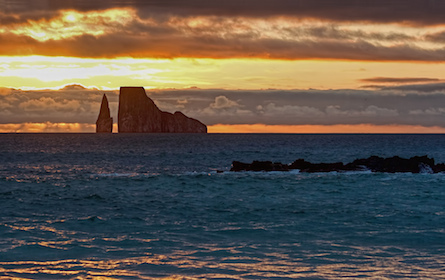 Do you have to pay a fee to enter the Galapagos National Park? Travelers going to the Galapagos must pay the national park fee. Payment is made in US dollars at the airport in the archipelago. It’s $100 for travelers 12 years and older. The tourist card (sometimes called INGALA) is an immigration control measure that enables the government of Ecuador to control immigration to the Galapagos. At the INGALA window in the domestic terminal at the Quito or Guayaquil airports, travelers going to the Galapagos need to pass their luggage through the special control checkpoint to ensure no animals, seeds, or biohazardous material ends up in the Galapagos. The cost per transit card is U$10 each way (or $20 roundtrip) per traveler. Keep you card in a safe place with your passport because you’ll need both to get on the plane to the Galapagos and then again at the end of your trip. Ask your travel advisor if the tourist card fee is included in your tour package or not. To go to most of the visitor sites in the national park, travelers must be with a certified naturalist guide. Guides are included in our Galapagos cruise and land & sea tour packages, speak English, and will definitely enhance your understanding and appreciation of the islands. What type of money is used in the Galapagos? Cash is king in the Galapagos. The U.S. dollar is the official currency in the Galapagos, like the rest of Ecuador. In addition to paying the national park fee (U$100 per adult ), cash is also convenient to have – ideally in small notes – to pay for meals and make small store purchases. There are ATMs in Puerto Ayora and Puerto Baquerizo Moreno. What’s the best tour option if you get seasick? Land & sea tours are likely the best way to go if you get really seasick. This way you don’t have to worry about any swaying motion of a boat cabin. But you’ll still want to bring some seasickness remedies for shorter boat rides to explore marine sites in the national park and between inhabited islands. If you book a cruise, go with a larger, more stable boat to avoid seasickness. Smaller boats, such as yachts and catamarans, feel ocean swells more. Sailboats are the least stable in the water and most unfavorable option for passengers prone to seasickness. 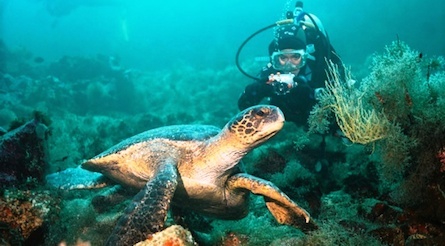 Where can you scuba dive in the Galapagos Islands? 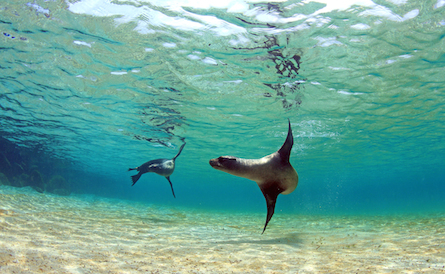 Scuba diving is permitted in the Galapagos at marine sites within the national park. Divers must be certified. Ask your travel advisor for more information about a land & sea package with an emphasis on scuba diving. Scuba diving is not permitted on every cruise. Only certain boats are dedicated to scuba diving. What should I pack for my trip to the Galapagos? Clothing & Footwear: shirts and shorts made of lightweight material; waterproof jacket; some long-sleeve tops and pants for cool or windy weather; bathing suits; hat and sunglasses; walking shoes or boots along with strapped sandals (Teva-style). Essentials: passport, bank cards, US bills (official currency of Ecuador), motion sickness pills (if you get seasick! ), personal medications, sunblock and any other toiletries. Gadgets & Photography: a comfortable daypack for excursions, reusable water bottle, camera (ideally with zoom), binoculars, and (if you like) your own snorkeling or scuba diving equipment. 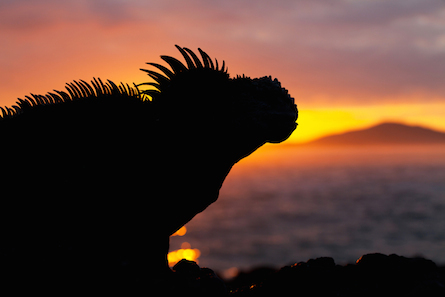 Experience nature at its best in the Galapagos. No fences, cages, or zookeepers allowed. How do you want to tour the remote archipelago? By cruise or land & sea tour? Enjoy a trip to the Galapagos with all the essentials.